The Holy Sacrament Altarpiece, by Dieric Bouts, is an important piece of Flemish art with an interesting story. The work presents the Last Supper in the central panel, surrounded by four panels showing Old Testament pre-figurements of the Eucharist. It was commissioned by the Confraternity of the Holy Sacrament for a church in Leuven, with specific instructions given by the two commissioning theology professors. Unlike traditional depictions of the Last Supper, which show Our Lord announcing the betrayal of Judas, they wanted this painting to depict Our Lord and His apostles at the moment when He first instituted the Eucharist. You can read more about the piece here. Eucharistic devotion was very strong in the Southern Netherlands, and there were many confraternities there devoted to the Blessed Sacrament. In fact, there was a special sort of tabernacle in use in Germany and the Low Countries, called a sacrament house. The Church prohibited them in the 1860s in order to make reservation of the Blessed Sacrament more uniform in tabernacles, but for 400 years they were in use. The oldest known example is in this same church, St Peter’s in Leuven, where the Bouts altarpiece is located. Many sacrament houses were destroyed during the iconoclasm of the reformation, but there are still examples extant, and you also see them in many Flemish paintings, although I must say, I have never really noticed them until now. A sacrament house was a large tower shaped structure, usually located on the north side of the church, intricately carved, sometimes with stairs and a railing leading up to it, where the Blessed Sacrament was reserved. The door had a grille or lattice, so that the Eucharist could be seen at all times. For our community, Holy Thursday is an important feast: The beginning of the Sacred Triduum, and the day on which Our Lord instituted the Holy Eucharist. His Real Presence is the Sun around which our lives as adorers revolve. And mixed with the joy of this gift He gives us, we have the sorrow of the Passion, about to begin in earnest after the Mass of the Lord’s Supper. For all our PCPA houses this is a sad day because Jesus is removed from the monstrance, removed from the tabernacle, and taken to the altar of repose. 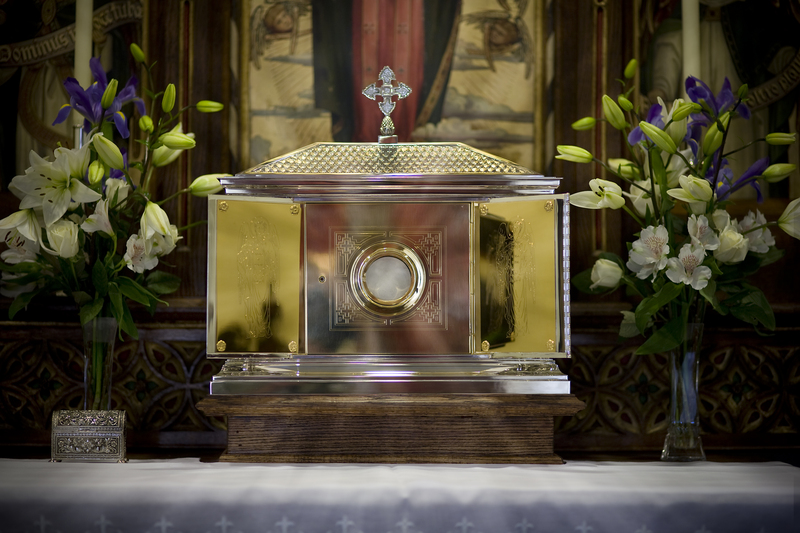 And though we follow him there, the open tabernacle is like a gaping wound, there is no mistaking the empty feeling that takes over the darkened chapel during these three days that He is absent. We will follow Him to the Garden, follow Him as He is dragged before His many accusers, Annas, Caiaphas, the Sanhedrin; we will follow Him to prison, to Pilate, to Herod, and finally, we will follow Him along the Via Dolorosa, and to Calvary. With Our Lady as Mother and guide, we will accompany Him, in our own inadequate way, throughout the events of our redemption, awaiting His victory over death and hell, and His return to our midst.